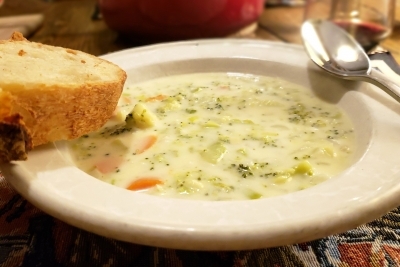 Here in wintry Vermont, where the snow drifts high and the thermometer drops low, nothing beats a hearty soup to provide a warmth that emanates from the inside out. Paired with a crusty bread or baguette and a crisp fresh salad, it’s an excellent choice for a comfy lunch or dinner. One of my favorite winter warmer uppers is a cheesy broccoli soup, though it took me a bit of experimenting to find just the right one. I’d prepared more than a few promising recipes in hopes of finding that ultimate combination of ingredients, but came up shy of one that perfectly hit the spot. This version, one that combines the best ingredients from the tastiest recipes, is my take on using the right ingredients at the right balance and one that I go to time and time again. As with any recipe, using quality ingredients is key. Choose only the freshest vegetables and aromatics. My version builds flavor by using a combination of alliums—onion, leeks, shallots, scallions, and garlic—and only the finest butter and cheese. [I use Cabot Creamery butter and extra sharp cheddar cheese, not only to give a shout out to one of Vermont’s most recognizable brands, but because Cabot products are both high in quality and reasonably priced.] Freshly grated nutmeg, in place of pre-ground nutmeg, adds a noticeable depth of flavor. Finally, use a sherry or Marsala wine suitable for drinking by the glass rather than a cooking variety. Bring vegetable broth to a boil. Add broccoli and carrots, return to a boil, and cook for 10 minutes. Remove from heat and set aside. DO NOT DRAIN. Turn the heat under a Dutch oven to medium high and add butter. When milk fat has mostly disappeared, add celery ribs, leeks, shallots, and scallions. Sauté until golden brown, 7-8 minutes. Add garlic and cook for 1 minute more. Combine flour and nutmeg and sprinkle over sautéed mixture, stirring until onion mixture is thoroughly coated. Continue stirring for two minutes, making sure flour/onion mixture does not burn. Add milk, one cup at a time, and continue stirring until the mixture becomes thick and begins a constant bubble. Cook for 2 more minutes. Remove from heat and add cheese, 1/2 cup at a time, until thoroughly melted. Stir in the broccoli and carrots, including their cooking liquid. Return to heat until warmed through. Serve with a mixed salad and crusty bread.